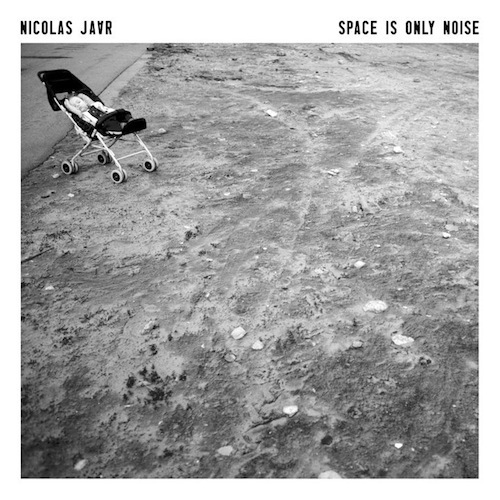 Nicolas Jaar had already established his unique sound before this album came out. Through a couple of EPs and some vinyl singles we got to know his dance music that you can't quite dance to, this is an artist who mixes styles such as jazz, slo-mo house, hip hop, techno and many others into a sound that doesn't really end up sounding like any of these genres. He talks in interviews of his idea that everyone in a club is lonely, and the slow BPM of his more clubby tracks reflects that, but his previous releases, excellent as they were (Time For Us, Angles, El Bandido, Mi Mujer...the list goes on) belonged as singles and EPs. There is always a danger that an electro artist used to single releases will not quite get a grasp on the cohesive vision required of an LP. By all accounts, Jaar has completely succeeded in his debut album. Structured cinematically between two minimal pieces that veer between ambient and classical (both named Être), this album is brilliantly sequenced and shows he is an artist of extraordinary talent and range. The album title is a telling one, Jaar is completely fixated by concepts of space is in his music, and in each track you can tell every sound is carefully cropped and positioned to a perfect placement. Nowhere is this more clear than on the brilliant second track Colomb with an achingly minimal aesthetic where a quiet handclap and light beats takes the place of drums. It's overlain with French vocals that feel like the emotion has been bled from them, this track is a flawless composition of quiet, clattering noises that are heard out there in the space of the noise, you can hear water trickling somewhere in the distance; this music creates a vast soundfield which is sparse, delicate and endlessly enthralling. The entire run of the first 8 tracks is superb, with Jaar effortlessly showcasing different rich, layered compositions where his voice leads more as a texture than a vocal track. Too Many Kids Finding Rain In The Dust opens with a lingering guitar oddly reminiscent of Liars' Here Come All the People but a regular strumming bassline and a number of surprising twists and turns (including a fantastically unsettling string interlude where the instruments sound slightly out of tune) show that this entire album is beyond comparison to any other, it is completely unique. Keep Me There builds with a razor-sharp beat and Jaar's wordless vocals anchor the song in its own melancholy, before a drop where a saxophone sears across the track in stuttered, unexpected interludes that issue a powerful cry and cement the track as a firm album highlight. Another is the following track, the expertly engineered I Got a Woman which is less a cover and more a homage in another style, the only similarity really being Ray Charles' vocal line which Jaar clips; he has an incredible knack for taking a vast amount of different sounds and turning them into just another carefully lacquered texture in his soundfield. Despite all this minimalism and artistry, the album has a real drive to it, the beats are strong and make sure the music never gets lost in the self-contained worlds it creates. This is clearest on title track Space Is Only Noise If You Can See which is close to a straight cut as the album comes, with a bouncing drive coupled with Jaar's odd skill at singing short phrases that just don't leave your head (at one point I had the line “Replace the word space with a drink and forget it” in my head for about a week). However what stops the album short of brilliance is that you have to completely buy into its self-contained world of detail and texture in order to love it and appreciate it as a whole, but the second half of the album just isn't that lovable. Almost Fell is an interesting exercise with conflicted synths and clattering objects but it has no real discernible melody or rhythm to it, Balance Her In Between Your Eyes is unsettling and ultimately sounds a-melodic, and not in a good way. It does pick up again- Specters Of The Future is a nice little tune of choppy funk and the penultimate track Variations is a stunning, constantly shifting and glitching piece- but after the brilliant first half the album feels like it loses it's consistent quality, and I would say the second half of the album is only worth listening to as an extension of the first when playing the whole thing through, these tracks don't stand up so well on their own (except Variations which is indeed a treat). For an artist grounded in music for the dancefloor (sort of), Jaar shows remarkable ability in crafting a fully formed vision of an album that is coherent, but unfortunately the music towards the second half drifts slightly in quality. But still, he clearly displays a deft hand at arrangement and some spectacular composition all in a genre that he pretty much occupies by himself, so it'll be fascinating to see where he ends up next. That sums up the album pretty damn well for me. I think I was blind to how inferior the second half of the album is for a while because I didn't want to accept it. Now I can. I totally had the same thing with the lyrics in space is only noise as well!